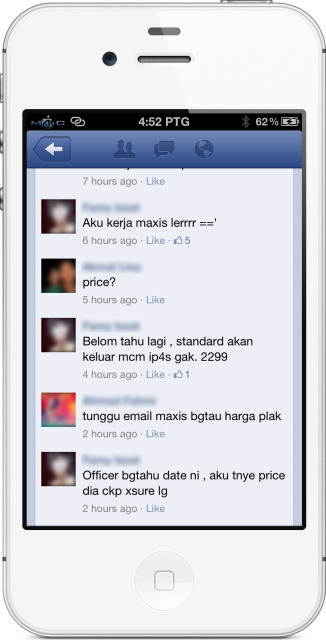 As a Maxis user, there’s no doubt that Maxis 3G Mobile Internet is quite reliable. In Klang Valley, I’m getting 3G coverage in every corner of KL. And when I’m back to my hometown, Maxis 3G Mobile Internet seems to be the fastest. At the early age when iPhone was first introduced my Maxis in Malaysia, the 3G mobile internet used to be throttled when the quota has been reached. And with the launching of iPhone 4, the speed of the 3G mobile internet will remains the same once the quota has been reached, but the additional internet usage will be charged at RM0.30/MB, and the charges will be capped at RM250. To make thing worse, at that time, there is no way for us to find out how much data have we used up, and also there is no SMS notification upon reaching the quota. 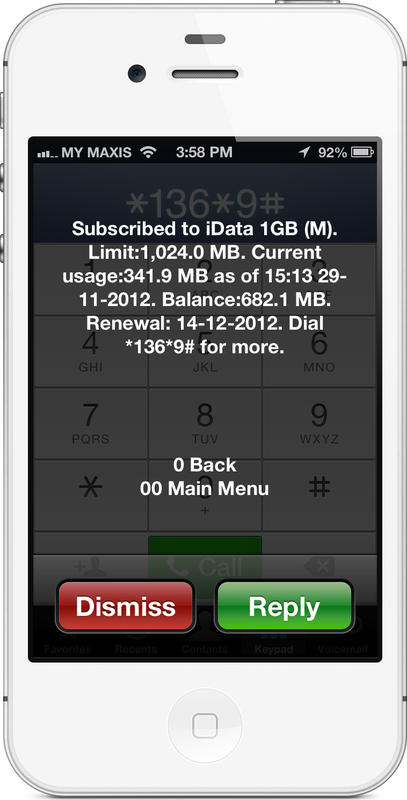 I used to blog before on how to check the month data usage to avoid receiving shock bill. 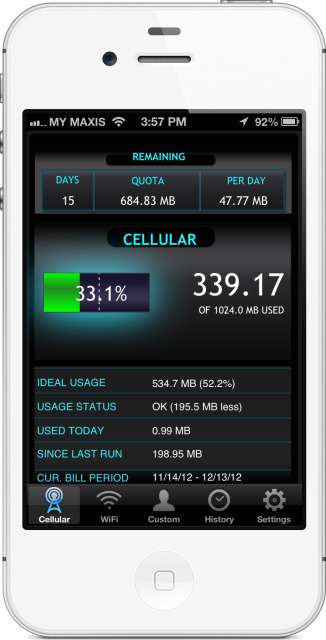 And with the launching of iPhone 4S, the 3G Mobile Internet data usage becomes worse. There’s no speed throttle, and there is no price max cap now. 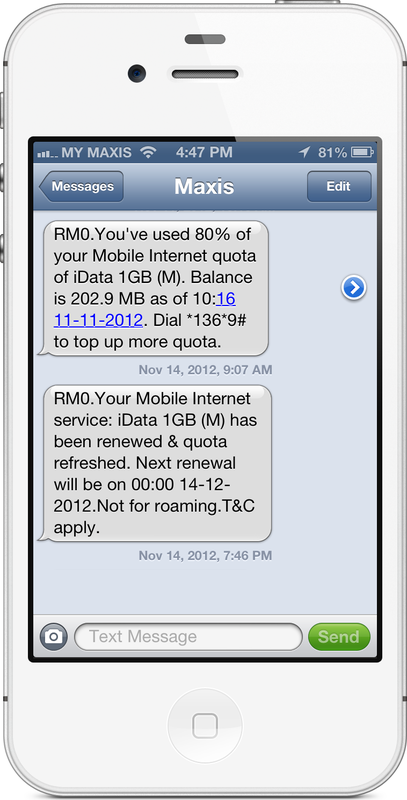 Meaning, is you have used an additional data with RM1k upon reaching the quota, then you have to pay that RM1k. But to compensate for this, Maxis makes it easier to check the current data usage by dialling *136*9# on the phone. SMS will be sent as well upon using 80% of the available quota, also once the quota has been renewed and refreshed on the next bill cycle. Not only with that, I also install an app that will keep track of my data usage, in case I need a quick glance of how much data I have used. 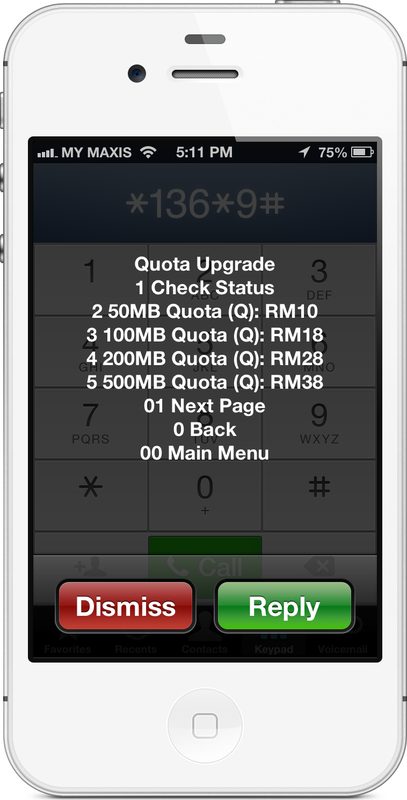 Once you are reaching the data usage quota, Maxis makes it easy too to do the quota upgrade by offering a few quota upgrade plans. But despite all of these services and tools, it is quite a tiring chore for me to keep checking my quota usage everytime. And I’m always in worry, fearing that I’ll overuse the allowed quota. And I envy my friends of those the users from different telco that they have an ease of mind of using mobile internet on their iPhone. iPhone 5 official launch in Malaysia seems to be around the corner. 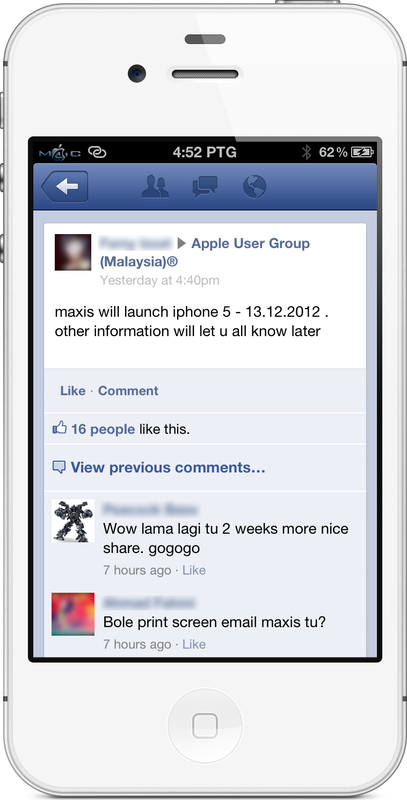 This is the update that I got from Appele User Group (Malaysia) that one of the Maxis staff revealed that iPhone 5 will be officially launched by Maxis on 13th December 2012. Well, will I join Maxis queue again this time to get iPhone 5 on the launch day, like what I did for iPhone 3G, iPhone 4 and iPhone 4S last time? Well, I have decided not to join Maxis queue this time, and I’m will not be getting iPhone 5 on the launch day this time, as I want to finish my current contract with Maxis, and to a MNP to a different telco (Celcom maybe). I’m too tired, and have had enough of the tiring chore while using my iPhone with Maxis. But, the following SMS that I got about 2 hours ago change everything. Thanks Maxis for finally listening to this. Starting 3rd of December, the RM0.30/MB charges upon exceeding the plan quota will be removed, where we can continue to surf at the reduced speed. And should we want the normal speed again, we can purchase the quota upgrade anything. 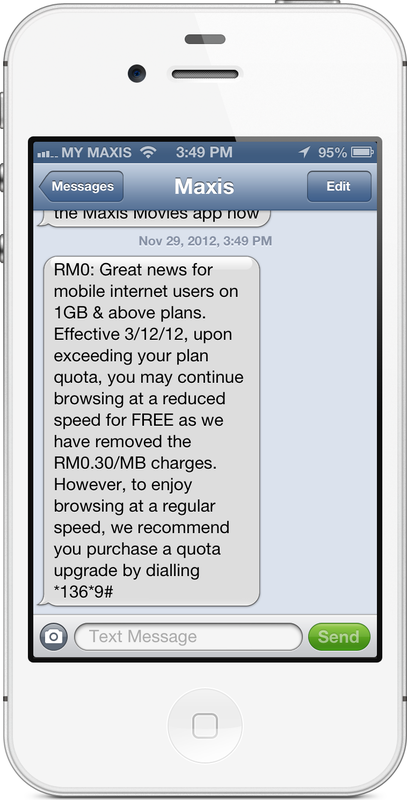 Looks like I will still be sticking to Maxis. So see you soon on the next Maxis iPhone 5 launch. *136*9# doesn’t work anymore as of today…any other alternatives?